Matrix 5e offer both unshielded and shielded system, in full compliant with EIA/TIA 568-B.2 and ISO 11801 D channel, providing significant margin in both return loss and NEXT, in support of many different networking requirement, including 1000Base-T, Broadband video, 3D video and other multimedia applications. 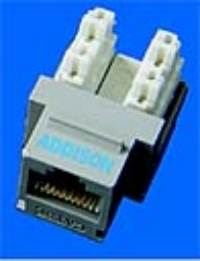 Matrix 5E is a high performance cabling system. With the use of impedance matching components, the data error rates of the channels are highly reduced, thus increasing the transmission performance and efficiency to a great extent. Matrix 5E components work in full harmony with the cables, significantly increasing the margin for both permanent link and channel testing, thus highly reducing the interference during the data transmission. Matrix 5E provides extended working frequency up to 350 Mhz. Through the special design in the twist distance in the cable pairs, the cables can be tested up to 350 Mhz which provides the best support for the current and future multimedia applications. Matrix 5E cables fulfills the testing procedures as governed by ASTM6 D4566, complying with Power Sum requirement, which is very critical for reducing signal distorsion as this is the total sum of the crosstalk from each of the other pairs in the cable and this will more accurately reveal the actual crosstalk performance of the cables. 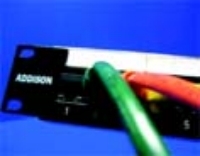 In 2002, Addison launched out enhanced Shielded system, which effectively provides superior EMI/RFI capability for the cabling system. External interference source usually has very adverse effect on the system performance and to reduce these interferenc, Matrix 5E enhanced shielded system adopts either the individually shielded or individually shielded plus overall shielded cable. These cables are highly recommended for environments with great interference sources which may significantly affects the attenuation, NEXT and also ELFEXT performance. Matrix 5E can offer different jacket types such as PVC, LSOH, LSFROH, CMR, CMP for meeting different fire performance requirements.